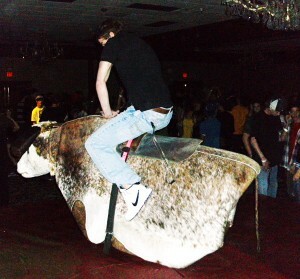 We run our mechanical bull rentals all over the state of Utah and operate out of Logan, Utah. We have done college parties from Utah Valley University (UVU) to Brigham Young University (BYU). We can bring the party to any event. We do fraternity parties, mardi gras parties, weddings, church and ward parties, family reunions, birthday parties, all-night graduation parties, and divorce parties (seriously). We’ve made all of them really fun, right here in Utah, from St. George, Provo, Orem, Lindon, Pleasant Grove, Draper, Salt Lake City, Ogden, and Logan. Nobody in the state of Utah is better insured and has more bulls available for rental than BMB Bulls.